February of 1982, Chicago Police Officers William Fahey #4194 and Richard O’Brien #5337 were killed in the line of duty. May 1990 - Honored two CPD Officers killed in the line of duty. 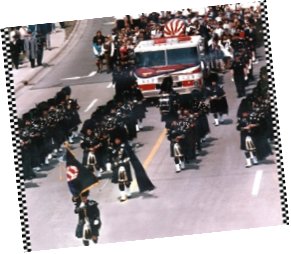 November 1991 - Gtr Cleveland Peace Officer’s Memorial Society Pipe Band came to Chicago. and Drums of New York Police Department and Ottawa, Canada Police Pipe Band. May 1992 - Participated in Mardi Gras in New Orleans. history that they have ever marched as a unit outside of Ireland. January 1995 - Fred McLaughlin missed his first practice in five years. October 1996 - Biloxi, MS Trip. May 1997 - First trip to Police Memorial, Washington, D.C.
September 1997 - Cleveland trip to honor Elliott Ness, who never had a funeral. 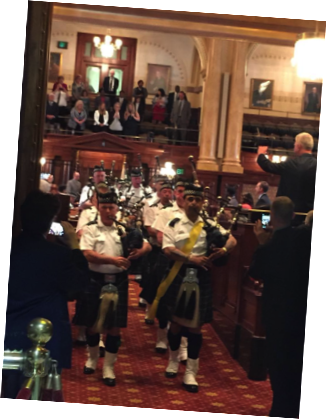 September 1998 - Bergen County Pipe Band attends Band Dance as guest band. September 2001 - Cleveland celebrates their first fifteen years. the WTC attack. We will never forget. May 2002 - We celebrate the first twenty years. July 2002 - Performed during the Schaumburg Fliers Baseball Game. September 2002 - Traveled to New York to honor our fallen, performing at the Javitz Center. October 2002 - Dedication of “Wall of Honor” at the Chicago Fire Academy. March 2003 - Performed during the Chicago Blackhawks Hockey Game. 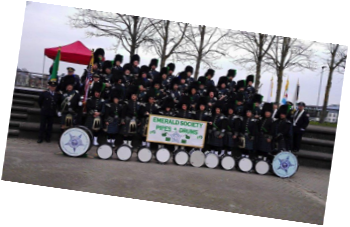 March 2003 - Participated in the Chicago Bagpipe Tunes of Glory Parade. May 2003 - Performed during the opening ceremonies for the Chicago Special Olympics. March 2015 - Traveled to Ireland and led the St. Patrick’s Day parade down O’Connell Street.